On the side of Reda’s fabric mill in Biella, Italy there is a mural with the words Il Cambiamento E Inevitabile which translates as “change is inevitable”. When it comes to fashion, nothing is more certain. Jacket lengths are a prime example of this slow, steady, cyclical change and today’s guide isn’t about telling what’s too short or long, it’s about helping you decide what’s right for your own personal style. For a classic, elegant look the rule of thumb applies; your jacket should reach the tip of your thumb when your hand is relaxed, if you curl your fingers you’ll be able to cup the hem of your jacket in your hand. This length suits a medium-wide collar and lapel and suits men who are taller with a larger frame. Like I said at the start, change is inevitable, this length will become the fashion length again, it’s only a matter of time. For a modern look that suits all styles of collar and lapel a good jacket length is in line with your knuckles. This is a length that is flattering for men of all shapes and sizes and has an enduring appeal. It’s neither too classic or too fashion-forward. 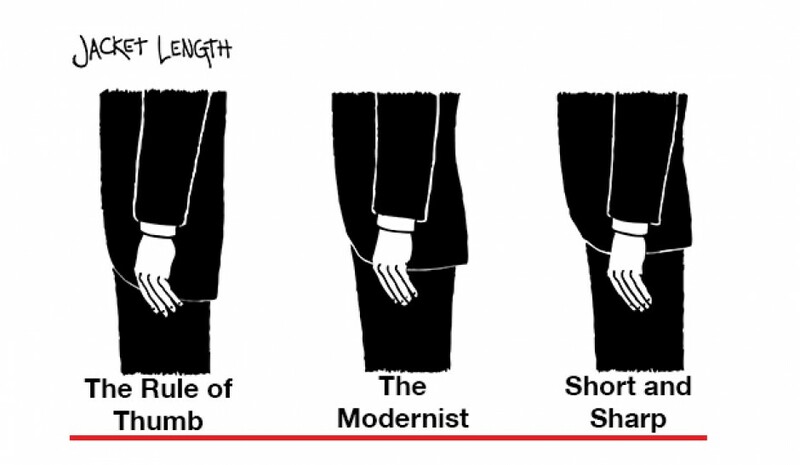 If you’ve checked out any men’s style blog on the internet in the last couple of years you’ll know that short is where fashion is at. It’s a great look, one that makes even the most classic navy blazer feel younger, cooler and more casual, but it really has to be slim to pull it off. Colloquially known as a “bum freezer” this length works well with a very short trouser…but more on that soon.